This recipe is simple, fast, healthful and quite tasty. It also makes plenty, so it's a good choice if you're feeding the masses or teen boys. 1. Spray a large nonstick skillet with nonstick spray and set over medium-high heat. Add the kielbasa and cook, stirring occasionally, until browned, 3-4 minutes. Transfer to a plate. 2. Heat the oil in the skillet over medium-high heat. Add the onion, bell pepper, garlic, and jalapeno; cook, stirring occasionally, until the vegetables are softened, 4 minutes. Add the broth, tomatoes, rice, olives and salt; bring to a boil. Reduce the heat; cover and simmer until the rice is almost tender, about 35 minutes. 3. 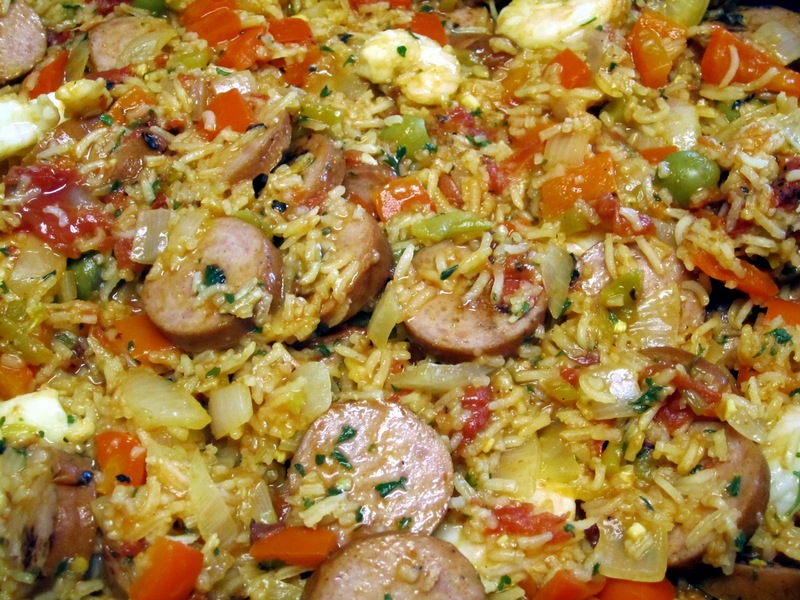 Stir in the kielbasa and shrimp (if desired). 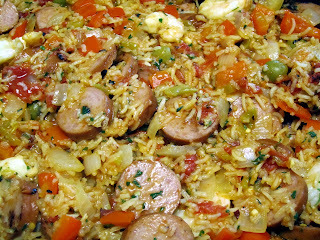 Cover and simmer until the rice is tender and the kielbasa is heated through, about 5 minutes. Fluff with mixture with a fork and stir in the parsley. Per serving (1 cup): 261 calories, 11 grams fat, 3 gram sat fat, 0 gram trans fat, 40 mg cholesterol, 1,118 mg sodium, 26 carbs, 4 gram fiber, 16 gram protein, 51 mg calcium. Though it looks and sounds very good, Where is the saffron? that's what makes Paella best. Wright still makes the second best I have had. Anne, I have a container for you in the freezer for your next workathon. Beastly, I don't like saffron, so even if the recipe called for it, I wouldn't use it. Hopefully, that next workathon is a couple months away.